The automotive AC compressor is a key element of the HVAC system. HVAC systems are widely accepted among all class of vehicles and across all regions, irrespective of climatic conditions. The AC compressor compresses the refrigerant, primarily R134a, and sends it to the condenser. The AC compressor is used for pressurizing the AC unit and keeping R134a flowing so that it can work properly. The AC compressor works in a constant on-off cycle. The conventionally used AC compressor is driven by the engine via a V-belt and pulley. The AC compressor unit consists of compressor pistons, magnetic clutch, valves, connecting points for refrigerant points, housing, and plates. AC compressors are utilized for ventilation, air conditioning system, and heating of the vehicle. The robust operation of an AC compressor for both air conditioning and heating purpose has aided the product being independent across all climatic conditions. Rise in vehicular emissions and industrialization is raising the global temperature, thereby adding to the overall rise in temperature by 1-2 degrees Celsius year-on-year, approximately. Rise in global warming is propelling the consumer demand for air conditioning in vehicles for better vehicle interior environment during commutation, considering the extensive time spent in vehicles during commute. The advent of globalization, liberalization, and privatization has boosted urbanization and industrial sectors, which in turn is likely to propel the demand for light vehicles in the global market. HVAC systems are deliberated to be an integral part of the automobile due to escalating consumer demand for comfy, cozy interior ambience. This, in turn, is driving the automotive AC compressor market. AC compressors support the function of the air conditioning unit in both cooling and heating. Its dual functionality is a key feature that is utilized in most climatic conditions. The rotary segment is witnessing expansion due to compact size, low operating noise, and the demand for enhanced engine-efficiency. However, the scroll type of rotary compressor is more expensive, as compared to the other options, as it provides more benefits such as compact size and superior performance. These factors are boosting the scroll-rotary segment at a rapid pace. Electric AC compressor is majorly utilized in electric and premium vehicles. The electric AC compressor segment is likely to expand at a rapid pace owing to the increase in the demand for such vehicles. 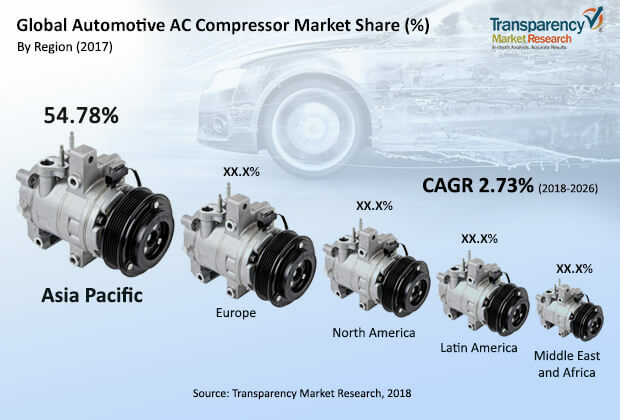 Increase in production of vehicles and amount of vehicles in use in various regions influence the sales channel of the automotive AC compressor market. Demand for automotive AC compressor is directly proportional to the demand for AC-equipped vehicles. Currently, most vehicles are equipped with an air conditioning system and hence, the AC compressor market is directly proportional to production of vehicles. This is a principal cause for the lesser market penetration of the aftermarket segment. Need for climate control systems in vehicles, rise in demand for comfort and easy rides, drop in vehicle loan rates, easy accessibility to customized monetary schemes, and rise in purchasing power capacity due to surge in per capita income of consumers are major factors attributed to the significant market share held by the passenger vehicle segment of the automotive AC compressor market. Increasing car sales after economic depression, rapid expansion of economies of several countries, and growing disposable earning are anticipated to fuel the AC compressor market during the forecast period. Asia Pacific held a noticeable share of the global automotive AC compressor market in 2017. It is likely to maintain its dominant share of the AC compressor market during the forecast period owing to expansion of the IT sector, which has increased job opportunities in the region. Likewise, the demand for transportation has been rising over the last couple of decades, which has led to the consistent expansion of the vehicle industry in countries such as China, Japan, India, and South Korea. The AC compressor market in Latin America is anticipated to expand at a significant growth rate due to the rise in production of automobiles in the region. A major factor driving the market in the region is significant investments by OEMs and governments of countries in the region, which in turn is boosting vehicle production. This, in turn, is driving the demand for automotive AC compressors. Rapid economic development witnessed in Brazil and Mexico and rising demand for comfort and convenience are expected to propel the demand for automotive AC compressors in the region. Demand for electric compressors in Europe is increasing at rapid pace, which is expected to boost the automotive AC compressor market in Europe, in terms of revenue, as the price of electric AC compressor is higher than that of a conventional one. Europe witnesses a significant share of electric vehicles and optimistic efforts by regulatory bodies from the region are expected to further propel the demand for zero-emission vehicles in Europe. This, in turn, is ultimately anticipated to boost the automotive AC compressor market in the region. The automotive AC compressor market is dominated by the existence of major key market players, as manufacturing of AC compressor requires considerable precision and is a highly expensive and complicated affair. Very few players dominate the aftermarket for AC compressor, as the market share held by the aftermarket segment is negligible as compared to the OEM segment. Major players operating in the global automotive AC compressor market include Behr Hella Service GmbH, Calsonic Kansei Corporation, Continental AG, Delphi Technologies, DENSO Corporation, Hanon Systems, Keihin Corporation, MAHLE GmbH, Michigan Automotive Compressor, Inc., Robert Bosch GmbH, SANDEN, Subros Limited, TD Automotive Compressor Georgia, Toyota Industries Corporation, and Valeo. Major players are focusing more on expansion, joint ventures, and mergers and acquisitions with local players and component manufacturers in order to strengthen their position in the market. Numerous key players are emphasizing on research & development activities in order to enhance the size, operation, and effectiveness of the AC compressor. This report analyzes and forecasts the market for automotive AC compressor at the global and regional level. The market has been forecast based on revenue (US$ Mn) and volume (Million Units) from 2018 to 2026. The study includes drivers and restraints of the global automotive AC compressor market. It also covers the impact of these drivers and restraints on the demand for automotive AC compressor during the forecast period. The report also highlights opportunities in the automotive AC compressor market at the global and regional level. The report comprises a detailed price trend analysis, government regulatory scenarios, value chain analysis, which provides a comprehensive view of the global automotive AC compressor market. The Porter’s Five Forces model for the automotive AC compressor market has also been included to help understand the competitive landscape in the market. The study encompasses market attractiveness analysis, wherein end-users are benchmarked based on their market size, growth rate, and general attractiveness. The study provides a decisive view of the global AC compressor market for vehicles, by segmenting it in terms of drive type, design type, vehicle type, sales channel, and region. These segments have been analyzed based on present and future trends. Regional segmentation includes the current and forecast demand for automotive AC compressor in North America, Europe, Asia Pacific, Latin America, and Middle East & Africa. The report also covers demand for individual application segments in all the regions. The study includes company profiles of major players operating in the global automotive AC compressor market. Key players in the automotive AC compressor market include Behr Hella Service GmbH, Calsonic Kansei Corporation, Continental AG, Delphi Technologies, DENSO Corporation, Hanon Systems, Keihin Corporation, MAHLE GmbH, Michigan Automotive Compressor, Inc., Robert Bosch GmbH, SANDEN, Subros Limited, TD Automotive Compressor Georgia, Toyota Industries Corporation, and Valeo. Market players have been profiled in terms of attributes such as competitive landscape, manufacturing footprint, company overview, financial overview, business strategies, and recent developments. The market for automotive AC compressor is primarily driven by rising demand for eco-friendly vehicles. The report provides the estimated market size of automotive AC compressor for 2017 and forecast for the next nine years. The global market size of automotive AC compressor has been provided in terms of revenue and volume. Market numbers have been estimated based on key design type, drive type, vehicle, sales channel, and regional segments of the automotive AC compressor market. Market size and forecast for each major type and vehicle have been provided in terms of global and regional/country markets.